Sometimes we go in search of adventure, sometimes adventure finds us. Put a speed boat, a stubborn tour company and a south-east Asian storm and you can smell an adventure brewing. I am not a water person, the swimming I know will probably save me in a shallow swimming pool. That’s because I would have splashed the water out of the pool with all the thrashing about I do. We went snorkeling in Maya bay, Thailand with a tour of Phi-Phi islands with a speed boat tour company. There were some 15 people in the boat and the guide plied us with medicine for nausea and warned us about the storm coming. They told us to trust them and trust we did. We started out in the boat with our flippers and snorkeling gear, our swim suits, towels and a change of clothes. 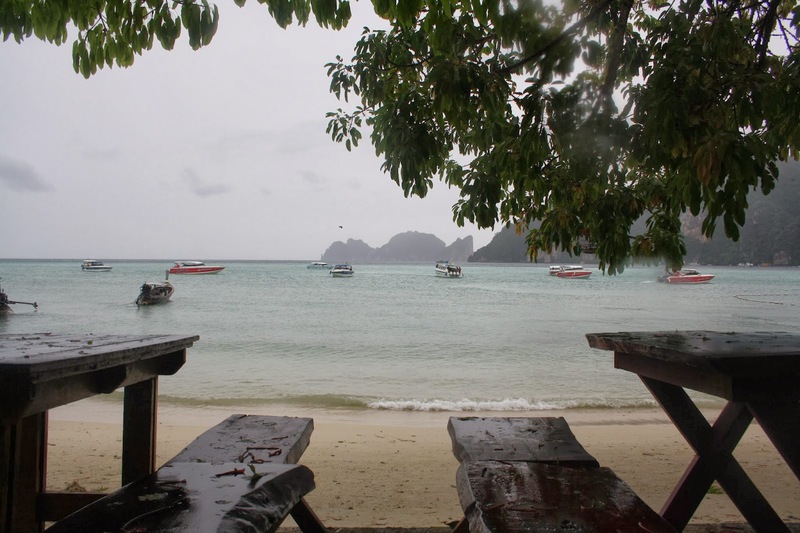 We reached Maya Bay and had a good snorkeling experience in the light rain. The lagoon reminded me of Neverland from Disney’s Peter Pan, its almost magical to be true and I didn’t want to grow up. Soon the rain turned to the promised storm and then we knew what being out in the open sea on a small boat meant. The sea picked us up and then whimsically dropped us down with every surge. The rain was relentless and the spray even more. By now all our clothes were wet and so were our towels and bags and whatever else was permeable including our skin. The passengers were miserable with nowhere to hide from the sea, the salt and the rain. The hurling started with one person and soon the black trash can moving back and forth was the only activity that anyone could bring themselves to do. Hugging each other for warmth seemed more important. We non sea-faring folks prayed for land. We reached Phi-Phi and we lost a half of our passengers for the return journey, maybe they thought they will stay in Phi-Phi till the rains stopped or maybe till the rainy season got over. The thought of food was nauseating but hey! you need something in your stomach for the return hurl. We still had hope because we bought a poncho to protect us from the rain. Oh just how hard the rain must have laughed at our futile attempts! But we were on a determined tour because our next stop for this miserable lot was a beautiful island whose name I was too damp to remember. All I remember was that we sat in the sea because the sea was warmer than the beach. We returned back to Krabi with a better understanding of life at sea and lots of respect for the fisher folk out there but would I do this trip again, absolutely!